Kendra Dandy wasn’t born in the ‘60s but that doesn’t stop her from going there. The Philadelphia-born artist/pattern designer draws inspiration from the fun patterns, color palettes, music and makeup from the ‘60s. Her vibrant, playful designs are an affectionate nod to the era when women started owning colors and prints as part of their daily style. 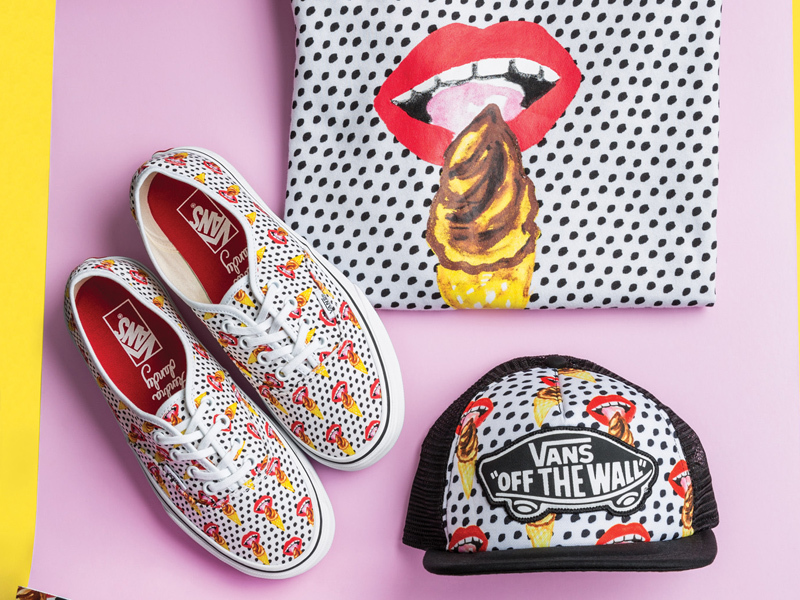 Now she brings her unique, smile-inducing creativity to her own Vans women’s collection. For spring 2017, Kendra and Vans present a collection of women’s footwear, apparel and accessories filled with sassy, modern objects and icons. The Authentic assortment includes three original hand drawn prints and custom colored foot beds. Sassy Side Up and I Scream are Kendra’s take on the traditional polka dots and feature a sassy faced sunny side up egg and red lips eating ice cream. Mod Eye is a revamped pastel colored version of the iconic checkerboard print. These prints can also be seen on a range of apparel and accessories including fleece, dresses, classic tees, backpacks and socks. Staying true to the Vans DIY aesthetic, Kendra’s collection includes a three-piece iron on patch pack and hangtags that are also stickers. The Vans x Kendra Dandy collection is available globally March 2017. Vans, a VF Corporation (NYSE: VFC) brand, is the original action sports footwear, apparel and accessories brand. Vans authentic collections are sold globally in more than 75 countries through a network of subsidiaries, distributors and international offices. Vans also own and operate more than 450 retail locations around the world. The Vans brand promotes the action sports lifestyle, youth culture and creative self-expression through the support of athletes, musicians and artists and through progressive events and platforms such as the Vans Triple Crown of Surfing, the Vans U.S. Open of Surfing, Vans Pool Party, Vans Custom Culture, Vans Warped Tour, and Vans’ cultural hub and international music venue, the House of Vans.